Oaxaca is a place I have been to countless times, but always leave wanting to go back. No wonder I was eager to bring the crew, so they could experience all that I kept telling them about. And mostly, so they could help me capture it to bring to you. My series director, Dan, must have been dizzy from me telling him how things are “different” in Oaxaca so many times. There is something in the air, and there is something in the way the light hits Oaxaca. It makes everything you think is familiar gain a completely different dimension. Maybe that is why Oaxaca is one of Mexico’s main cradles of art. The blue in the sky seems a deeper shade of blue. The green in the plants, mountains and herbs looks more intense and has more saturated hues of green. When you wake up in the morning and open a window, the air smells fresher and feels more crisp. The sun shines brighter. And the word “diverse” has never had a better match. Oaxaca is one of the – or the – most ethnically and culturally diverse places in all of Mexico. It has eight defined and distinctively different regions and 18 ethnic communities – each with their own culture, cuisine, language and pre-Hispanic forms of self governance and organization for life and society. To put it simply, as my dad would say, Oaxaca is another world. One of the common sayings related to Oaxaca is “the land of 7 moles.” But, the irony is that there are many more moles than that. There are dozens and dozens of them. Each mole has so many different versions, depending on the cook, the family or the town. Here, I am sharing a Coloradito Mole with Chicken. I tested it many times at home to get the exact taste I experienced in the city of Oaxaca. So many times that Sami, my middle son, would joke “coloradito, mami, coloradito?” every time he walked in the kitchen and saw a large pot simmering. Silky, delightfully sweet, savory, tangy, and with a light spice, it is a small window into the beautiful complex layers that Oaxaca has all around. Try it at home and join me for the new season that is about to premiere! Check your local listings here. Pati ,my husband and I Love Love your show so much, your receipts are amazing, thank you for everything that you have done for me and my husband are looking forward to seeing you in San Diego. Thank you guys so much, Sarita and Ernest! Pati, 1st know, I LOVE YOUR SHOW! 2nd, what you have said here about Oaxaca is spot on! I have been to Tijuana a few times and Nueva Laredo too, but nothing compares to Oaxaca! If I can just figure out a way to live there! Lastly, just in case any of your readers dont like shrimp, like me, I have used chicken in several of your dishes and they were fantastic! Aww thank you so much Joyce! I hope you make your way to Oaxaca soon. Can you replace almonds with peanuts if tree nut allergy is an issue? Watch you making this dish on your show. Looks delicious can’t wait to try it. The episode was so colorful and educational. I finally got my husband hooked on watching you. To more yummy recipes. Thanks for getting your husband hooked too, Arlene. Enjoy all of the recipes! This recipe was amazing! All the different ingredients made it so delicious. My entire family enjoyed it so much !! Thank you Pati! Hola pati! Me encantan tus recetas. 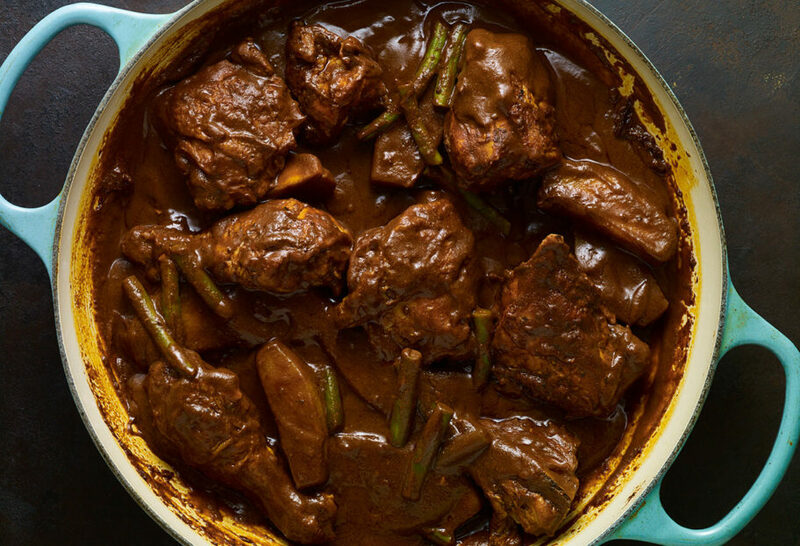 Me podrías ayudar a encontrar una receta de pollo en mole, o guisado, que el ingrediente principal del mole, es con semillas de cilantro. En tu próxima visita a México quizás la puedas encontrar. Gracias y te felicito por tu programa. Uy, lo buscaré en mi próximo viaje! I was in Oaxaca last July, 2017. I can’t tell you how I want to go back. I’m so glad the show brings back good memories, Carmen! I hope you get to return to Oaxaca soon. Made Coloradito Chicken , muy delicioso ! Thank you Patti for your accolades for Oaxacan cuisine. I’m a believer too. Was inspired by a marinated Shrimp ‘n Grits enjoyed in a high end restaurant in Ann Arbor Michigan. The grits were ringed by a delicious Oaxaca red-brown mole. Your Coloradito mole with it’s complex blend of flavors was very close. Took a few liberties with your recipe as I didn’t have ready access to the ancho or guajillo chiles, used my home dried jalapenos.but the results were wonderful anyway. Surely will make many more dishes from the wonderful Oaxaca region. I’ve been searching for a wonderful mole rojo recepie, and I cannot wait to teh this one-it seems yummy! Would you happen to have a receipe for a mole verde? Here is my mole verde recipe: https://patijinich.com/recipe/mole-verde-with-pork-and-white-beans/ I hope you enjoy them both, Esmeralda! Where in Fort Lauderdale, Florida can I buy Mexican ingredients. I’ve bought what I can from William Sonoma but they have only one or two things and no prepared mole. What to do. Love your show and as I always say in NYC where I live, without Mexicans we don’t eat! Thank you for tuning in Carol! I would try your local Latin grocery store…or online. Thank YOU Vicky! Enjoy it! I made this incredible dish for my son’s birthday. I don’t know if it was the myriad of ingredients, but it was the most joyful birthday dinner he’s ever had. We were all having an incredible time, and making this mole dish is something I highly recommend to anyone. Thank you so much for sharing it! Happy birthday to your son! I hope he has a fantastic year, and I’m sending him my best wishes. I’m trying this recipe for the second time! Your family is so lucky to have you. Can I have JuJu’s seat at your kitchen table? Oh I’m so lucky to have them! Hi, I’m heading to Oaxaca next month and was wondering about the restaurant you mentioned in the mole series, could you give me the name, I missed it. I bet it was either Las Quince Letras, Catedral or Los Pacos… go to them all! Thank you So much for sharing this receipe! I have been searching for a great mole receipe from scratch for so many years! I think your receipe will be perfect! I will be trying soon, I have never made mole from scratch and it is one of my favorite dishes!!!! I’m so glad this will be the first mole you make from scratch :). I have always wanted to learn how to make mole from scratch – it is 1 of my favorite dishes!!! Thank you SO much – I will try this receipe soon & hope it comes out as good as yours looks!!!! Oh I hope you love it Vero! Please send me the receipe for the mexican hambergers on your show the other day. They looked so good!!!!!! I religiously watch your show. I spent 6 months living in Oaxaca, and the Oaxacan episodes brought back so many warm and wonderful memories. Oaxaca is truly a magical town, not only for the food, the sights, but the people I’ve met, especially when going to the market. They all want you to try what they are selling, and gave recipes as well! Thank you for, you are awesome. And love episodes with your children (and from time to time your husband) as well. Thank you for sharing your lovely memories of Oaxaca, Tess! The only block Mexican chocolate I could find says that’s it’s for a chocolate drink! Would it be ok to use in this recipe? Hi Patti…I just LOVE, LOVE, LOVE watching your show. If only I could be there with you tasting your fabulous food. The Coloradito Chicken made my mouth water as you added each ingredient and then tasted the completed dish. And Oaxaca, Mexico seems like an awesome place to visit. Their culinary offerings sound like so much fun to experience. Ahhhh…Some day…. I dream of the day I can afford to make the trip. Thank you so much for putting so much warmth and joy into your programs. I could eat your food every day. Thank you for your message Linda! I hope you get to Mexico soon :). We love your new show Patti, as we love Oaxaca as well. Hope there will be a new cook book with these recipes soon? I am making chicken Coloradito next Saturday for a birthday…I’m sure it will be festive! I bought bags of both chiles through Amazon; when they arrived we could smell them through the bag-yum! Thank you for posting this recipe online. I have both your first two books; every recipe works-and they are delicious. Thank you Les and Catherine for watching the show, buying the books, and for loving the recipes :). Wow, hands down best mole I have even made — and not even close to the most complicated one. Thank you! The vegetable add a wonderful dimension — I added a calabasa squash as well. Question for you, how much oil should be integrated into the sauce once the chicken is browned? I felt like I too much, so pared it back, but really would like to know how much to target next time around as the consistence was perfect. It depends on how large your pan is…for my casserole covering it with oil to be 1/8 in deep is enough to use all of the oil with the sauce. But you can adjust it for your taste! Thank you for this amazing and inspired recipe! I usually just buy mole in a jar from the store because I realize how complex they are but you have convinced me to make this recipe. I could practically taste it as I was reading the article and recipe. Thank you for your inspiration! May God be with the people of Mexico during this time of crisis. I hope that your extended family in Mexico is safe after the terrible earthquake. Thank you Connie…my family is okay and my thoughts and prayers are with everyone. Can’t I just buy a jar of mole? Add a plaintain, Cinnamon stick, chicken broth, & chocolate pieces? This sounds like a great project for a chilly winter day. I love your approach and passion for cooking, you transmit more than a recipe , you transmit life. Joanna, thank you so much for this lovely and amazing comment. It means so much to me. Prepare el mole para mi familia y estuvo delicioso. Hi Pati, always liked your recipes and cooking. Do you have a new cook book coming soon? Love, love, love.. your cooking show! I record them to see later in the day..
We are puertoricans living in North Carolina, but our love for Mexico and its cuisine started many, many years ago while living in California, and since then, we have made so many good friends, specially from Oaxaca. That’s fantastic! I hope you make and share this recipe with your friends from Oaxaca ;). And thank you for sharing Ruth. Like to see more Chicken and mole receipe. Thank you for the request Esther…will try to get you some more soon. Are you kidding. Way to complicated. Your recipes are the best Pati! Got to try this. This looks very yummy. My family would love this recipe but will cut on the spices. Thank you for sharing, Patti !!! You can always adjust the spice level to your liking…I hope your family loves it Demetria! Some of the items needed for this recipe are not readily available. I find this recipe too difficult to make because I would never find these items. Sorry to hear this Sara…You can find lots of the ingredients online or at your local Latin market or the international food aisle of your market. Oh Pati! My mouth is watering! Pati,Your recipes are so Great and delicious,and your presentation is nothing short of perfect! Oh wow…thank you so much Harry! I love mole sauce and have attempted make from Rick Pales’s recipe. I seemed so involved, complicated but tastes good. I wound up buying it from market. Is it supposed to be so sweet? I have ordered it from Mexican restaurant and it was very good but still sweet. In preparing it myself ancho and guajillo chillies fresh from market or is dried chillies better? What difference is from Guacamole? I was raised in south east Texas and there many Mexican Texans there but only knew of tomales from roadside stands. Many of our neighbors were Italian and Lousiana Cajon so I grew up with the taste of that pluss my moms Southern cooking from Gorgia. Sorry but my taste buds got all watery and I could couldn’t let it go, Like South Carolina whole hog barbecue. Hi Charlie…yes the chilies are dried. The food you grew up on sounds delicious. Thank you for sharing! This sounds interesting to try with my lil girl. She wants to be a top chef when she is done with school. Teaching her to cook has always been fun and she loves “Hot Spices” on Everything! Showing her this recipe made her stop eating and asked to cook it during our supper.. That didnt happen! But she copied it to her laptop and has settled into getting what we need to do this recipe on Saturday even inviting a few friends to share the taste! My short little girl is another that wants to just eat anything she smells and lets her eyes close as she smells things in the kitchen. I hope to teach her one day to be like me and learn food is her center of what can become a goal for her when she is married. The two of them are doing great as far as trying to learn flavors and I am Thanking You for these recipes you show. Being a single parent is hard but getting the girls to do things is easy if they can see what brings them happy meals they can be taught. Onward and into Saturday to cook for our meal you have here! Awwww…thank you so much for sharing! This means so much to me. I hope your girls and you have many amazing kitchen adventures! Thank you so much for this recipe. Coloradito was my favorite mole on my visit to Oaxaca and I’m so excited to have this recipe. I can’t wait to try it. I hope you enjoy it Sue! Patti! As soon as I opened your email my mouth began to water! This is food for the gods! Oh wow thank you Chris!